Have you ever wished you could have a hot biscuit or muffin in the morning? But not carry a ton of weight? Or a huge pot? You can! I wandered around the house looking for what I could use to make it, and noticed I had a new windscreen that I hadn’t used. I smoothed it out, and laid my kettle on top. I traced the shape, then using scissors, cut it out. I then trimmed it down a bit so that it would fit in my pot. 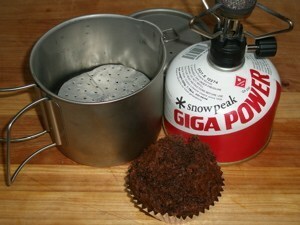 You want it so you can drop it in, maybe 1/4″ smaller than your pot inside. There are many materials you could use, one being my idea, another would be a disposable aluminum cookie tray from the grocery store. Then, using a ruler, I traced a grid of 1/2″ squares on it. I used a tiny phillips head screwdriver to do this. All I had to do was gently drag the screwdriver on the metal to leave a light line. You want one that is small, such as for jewelry work. A small punch would work as well. Now, I found a scrap piece of wood. I set my circle on top of the wood. Using the screwdriver I punched a hole carefully at the corner of each square on the grid I had traced. I then went and punched a hole in the center of each grid. I then cut another piece of the metal 14″ long and 1″ wide. It can be as long as you wish. This is what sits at the bottom of the pan, and is spiraled, to hold the circle up. When ready to get baking, put the spiral in the pan. Put water in till almost to the top of the spiral. Top with the circle. Next to the pot is my bag, ready with biscuit mix. You can prep the mix in the bag, then arrange the bag, so that opening is at the top. Do not seal. You can use freezer bags or small oven bags for this. I used a sandwich bag here, but I’d not recommend that as they are more fragile. Place bag in pan. 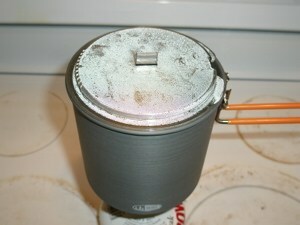 I put the pan on my Primus canister stove and brought it to a boil. As soon it was boiling, I hit the timer for 15 minutes, and lowered my stove to where it was barely burning. With the low amount of water in the pan, it continues to gently simmer/boil and conserves fuel use. 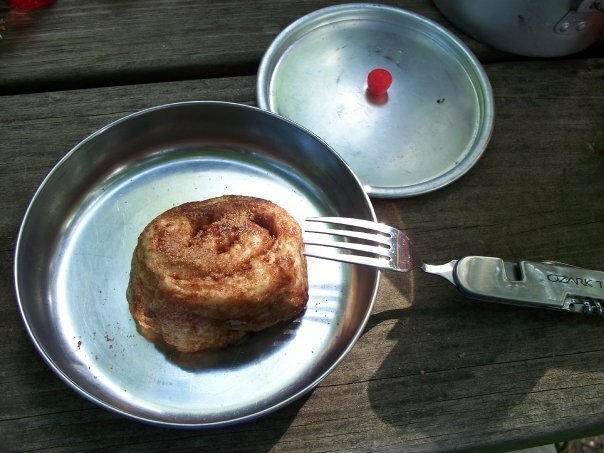 This would also work fine with an alcohol stove and 1 ounce of fuel. When the time was up, I turned the stove off and let it sit for 5 minutes. 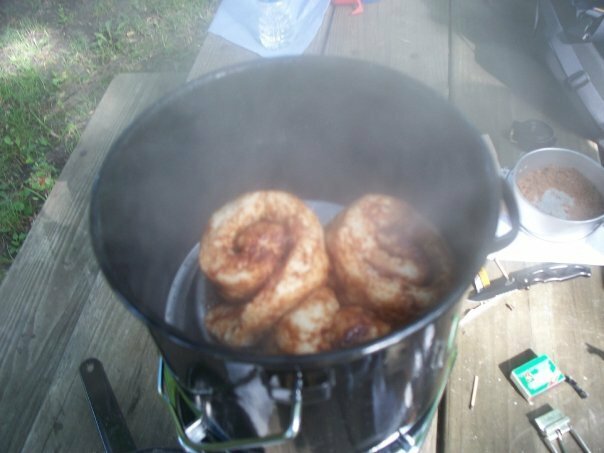 Supposedly, they say on the Bakepacker website to not open the pan while cooking raised items (biscuits, cakes, etc) as the cold air can cause the items to fail and flop. And did it work? Yes, it did! While it doesn’t get browned, it was perfectly cooked through. Moist and tender as well. It made enough for 1 person. For my trial recipe I used Bisquick mix. 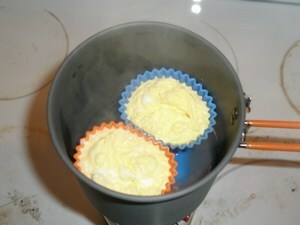 The Betty Crocker® mixes for muffins that call for just water work well also. Split the pouch in half, into two quart freezer bags. In the bag and sealed it, then I mixed it by kneading the bag. I then opened up the bag and put it in the pot. It is said that you can put paper muffin liners in the bags, and bake it that way, giving you a nice clean muffin/biscuit. From now on, I will use a quart freezer bag, and double my biscuit recipe so there is enough for both Ford and I. Half a bag of BC muffin mixes would be perfect for 2 people. Basically, if you can bake it in a Bakepacker, you can do it in this. Just cut your portions in half. 15 minutes seem perfect for cooking time, along with a 5 minute rest. And the weight? Less than 1/4 of an ounce. It was my friend, Ldyblade’s birthday. So I wanted to make her cake! I picked up a Betty Crocker Warm Delights mix at the store for around a $1. I tossed the bowl it came with into my “I might use it later” pile and packed the mix bag with a new heavy duty sandwich bag. 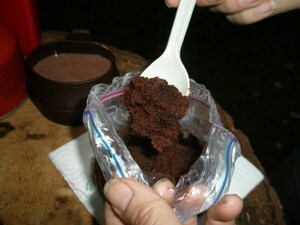 On Sunday night in camp, I mixed it up with 1/4 cup water. I put in into my pan as I described in the previous entry. I put it on for about 15 minutes and let it sit for a couple more minutes. The cake was very good. I can see stocking up on them when they go on sale. It is minimal fuel use and the results are worth the few minutes work! 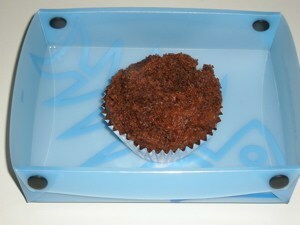 I went back to the drawing board wanting to try using aluminum foil cupcake liners to bake in. I am currently testing the “Easy Bake Oven® Theory” – that it is possible to cook in the Fauxbaker most items you could cook in a child’s Easy Bake Oven®. Before one laughs, what I noticed is that the EBO pans are about the same size as what you would use in a Fauxbaker. 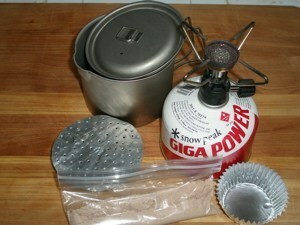 You will also need your stove, pan, 1 aluminum cupcake liner and a handmade Fauxbaker set. 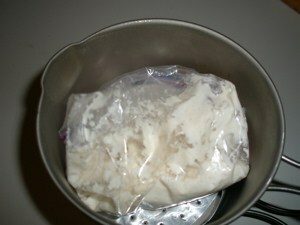 Add 2 Tbsp water to the mix, seal and carefully knead the bag till the batter is mixed up. Use your knife and cut off a corner of the bag. 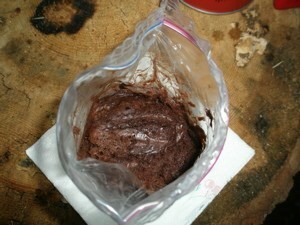 Pipe the batter into the muffin liner. Using the previous directions, get your Fauxbaker ready for use. Put the liner on top of the disc. Put the lid on the pan, put it on your stove and turn on. Bring the pot to a boil, then turn the stove down to its lowest setting. Let it steam gently for 15 minutes. Turn off your stove and open your pot carefully. Carefully pop out your muffin. Let cool for a minute or so. The liner peels off easily. 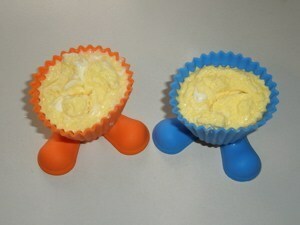 I came across Wilton® Silly Feet! 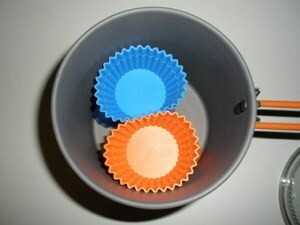 silicone cupcake baking cups. Silicone is good for temperatures up to 500* so my mind got tinkering. Would they work as a flexible and reusable baking form for steam baking? Would the feet on them give them the support they need to steam up right? The feet had me thinking I wouldn’t need rocks or a metal support system. You mean you all don’t ponder these things in Linen & Things at 10 am? Once home I set up two of the cups in my GSI Soloist pan. I interlinked their feet as if dancing close. Bring the water to a boil quickly, then turn the stove down to as low as it will go. Setting the timer to 10 minutes I let the water gently simmer, doing its steaming. A couple times I popped the lid and poked the crust of the eggs to help the interior egg get cooked. At 10 minutes I had hard cooked eggs. 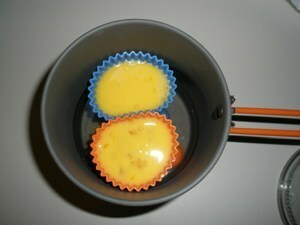 Two hot eggs cooling. The silicone is easy to grab even when hot. Blend ingredients, then mix in warm, not hot, water. flour), then stretch into the pan. Rise 5 – 15 minutes. 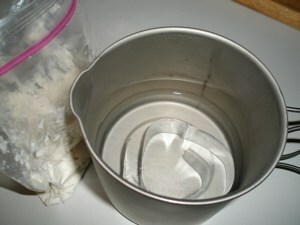 Mix powered sugar and water until desired consistency is reached.